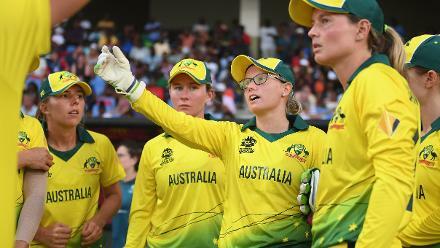 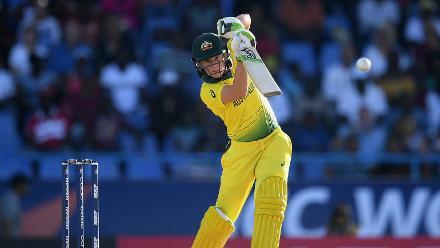 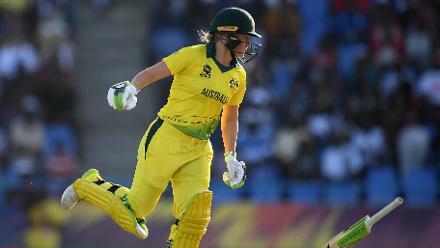 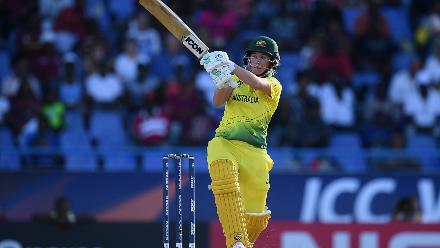 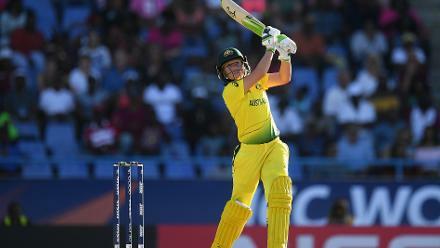 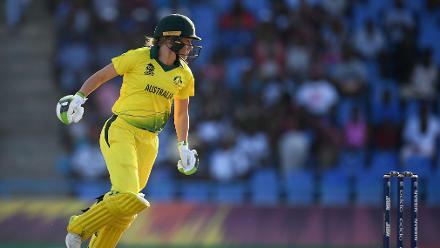 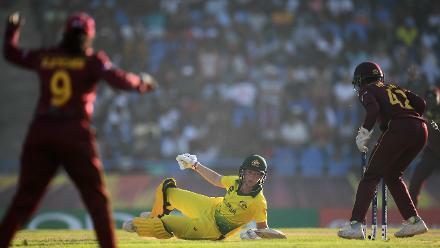 Meg Lanning of Australia reacts after just making her ground from a potential stumping chance during the ICC Women's World T20 2018 Semi-Final match between Windies and Australia at Sir Viv Richards Cricket Ground on November 22, 2018 in Antigua. 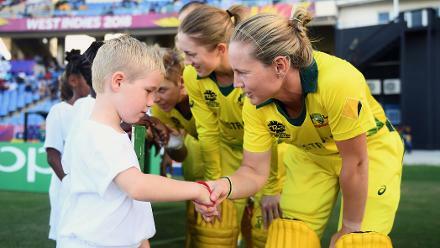 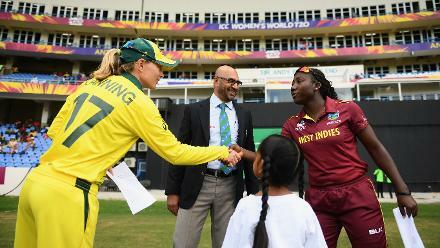 Meg Lanning of Australia shakes hands with a young mascot during the ICC Women's World T20 2018 Semi-Final match between Windies and Australia at Sir Viv Richards Cricket Ground on November 22, 2018 in Antigua, Antigua and Barbuda. 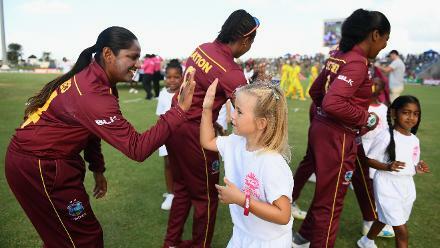 A young mascot receives a high five from members of the Windies side during the ICC Women's World T20 2018 Semi-Final match between Windies and Australia at Sir Viv Richards Cricket Ground on November 22, 2018 in Antigua, Antigua and Barbuda. 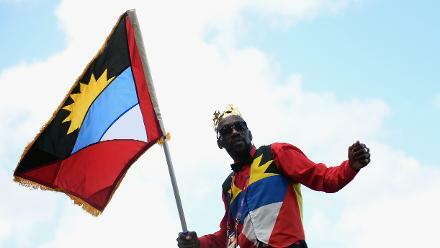 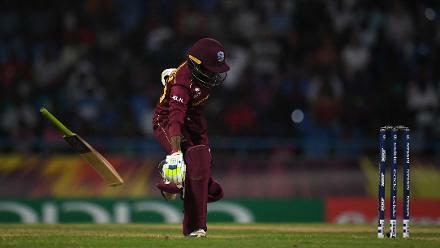 A spectator dances with a flag during the ICC Women's World T20 2018 Semi-Final match between Windies and Australia at Sir Viv Richards Cricket Ground on November 22, 2018 in Antigua, Antigua and Barbuda. 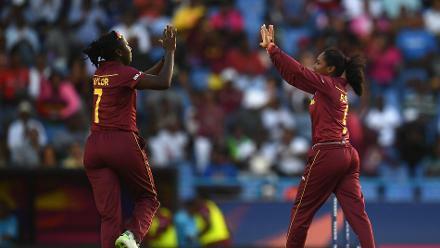 Hayley Matthews(R) and Shakera Selman of Windies celebrate after dismissing Beth Mooney of Australia during the ICC Women's World T20 2018 Semi-Final match between Windies and Australia at Sir Viv Richards Cricket Ground on November 22, 2018 in Antigua,. 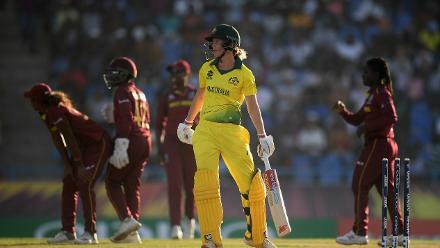 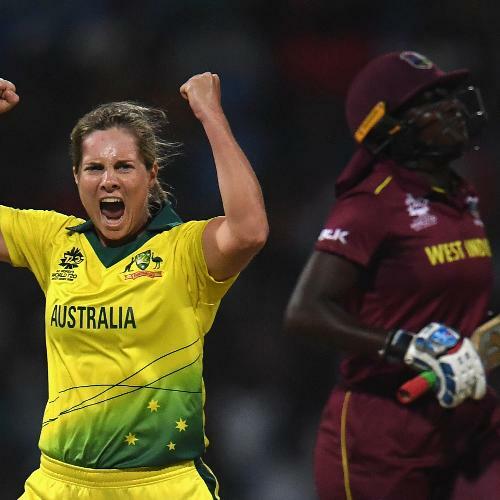 Delissa Kimmince of Australia celebrates after dismissing Stafanie Taylor of West Indies during the ICC Women's World T20 2018 Semi-Final match between Windies and Australia at Sir Viv Richards Cricket Ground on November 22, 2018 in Antigua,. 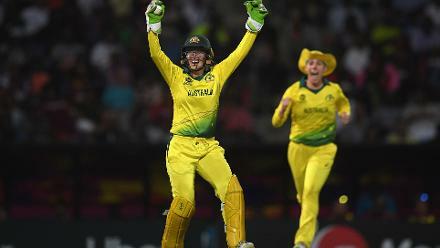 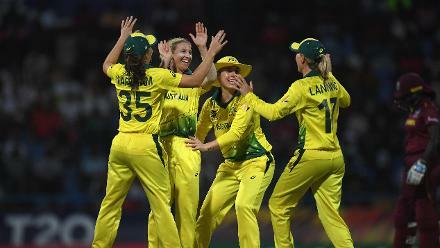 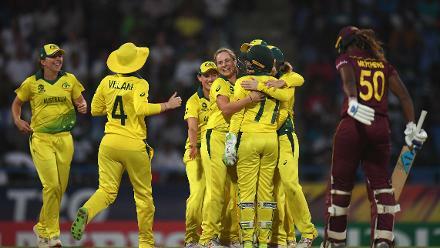 The Australia side celebrate as Alyssa Healy of Australia (back) stumps Hayley Matthews of the West Indies(R) during the ICC Women's World T20 2018 Semi-Final match between West Indies and Australia at Sir Viv Richards Cricket Ground on November 22, 2018. 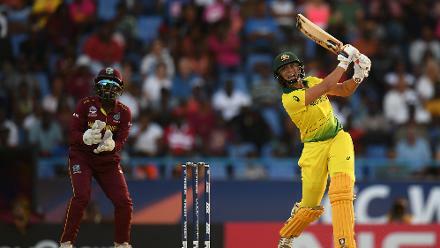 Delissa Kimmince of Australia(2L) celebrates after dismissing Natasha McLean of Windies during the ICC Women's World T20 2018 Semi-Final match between Windies and Australia at Sir Viv Richards Cricket Ground on November 22, 2018 in Antigua. 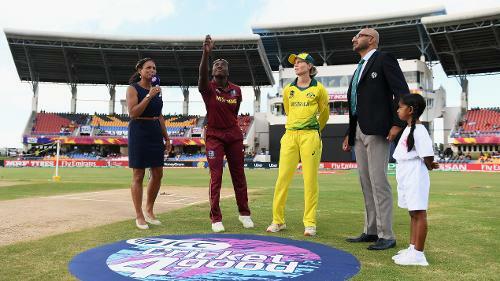 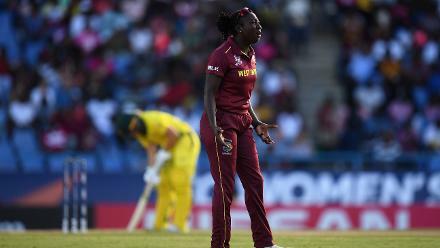 Hayley Matthews of Windies (floor) cuts a dejected figure as she looks towards the umpire after being stumped by Alyssa Healy of Australia(R) during the ICC Women's World T20 2018 Semi-Final match between Windies and Australia. 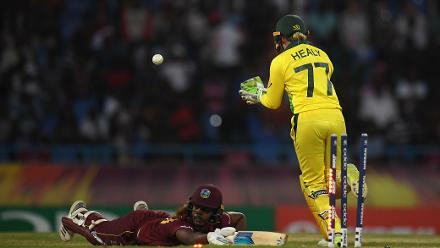 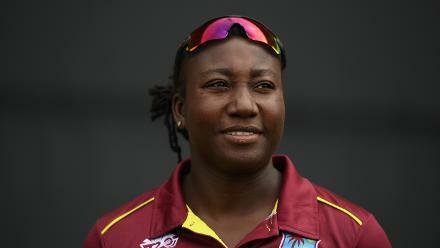 Shemaine Campbelle of Windies attempts to make her ground as she drops her bat during the ICC Women's World T20 2018 Semi-Final match between Windies and Australia at Sir Viv Richards Cricket Ground on November 22, 2018 in Antigua, Antigua and Barbuda. 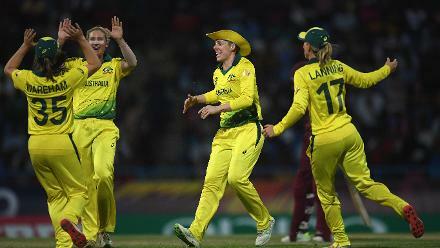 Delissa Kimmince of Australia(2L) celebrates after dismissing Natasha McLean of West Indies during the ICC Women's World T20 2018 Semi-Final match between West Indies and Australia at Sir Viv Richards Cricket Ground on November 22, 2018 in Antigua. 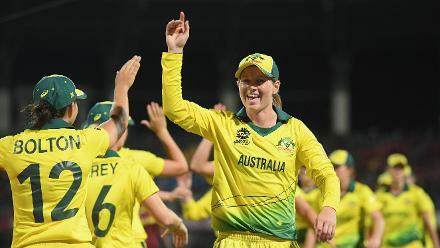 Meg Lanning of Australia(C) celebrates at the end of the match during the ICC Women's World T20 2018 Semi-Final match between Windies and Australia at Sir Viv Richards Cricket Ground on November 22, 2018 in Antigua, Antigua and Barbuda.